Are you a leader in higher education or aspiring to be one? 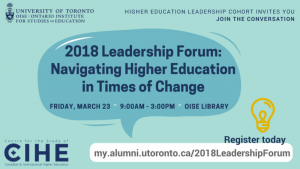 The OISE Higher Education Leadership Cohort invites you to join the conversation at the 2018 Leadership Forum: Navigating Higher Education in Times of Change. You will explore current leadership and management issues in higher education while connecting, collaborating and learning with our higher education faculty, staff, students and alumni. Registration fee is $25 per person, incl. breakfast and lunch.